When you are up a creek without a paddle, wade to shore and do a little fishing. David has deep Montana roots. He is a 4th generation Montanan and spent the first 30 years of his life growing up around and working in the cherry industry that is a hallmark of the Flathead Lake area in Northwestern Montana. For a number of years he operated his own cherry orchard management company. After cherries, he pursued other work, including several years of retail management. Persistent nudging from Jack Liebschutz (co-CEO) led to his employment with Black Mountain Software back when the company was just getting started. In fact, David was the first non-owner staff member at Black Mountain! 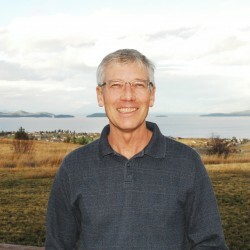 Over the course of 20 years, as Black Mountain Software has grown and changed, David has served in many capacities, including customer support, training, writing manuals, testing software, sales, marketing, internal operations, and most recently in a technical and support liaison role for our Montana County clients. When his children were growing up, David volunteered many hours over many sport seasons. Several quarters of college before deciding to just work!